Italy is a country in Europe, and was the center of the Roman Empire until its collapse. Italian cities led the Renaissance, with world-class artists such as Leonardo da Vinci, Donatello, Michelangelo, Titian, Tintoretto, Caravaggio, and Giotto. Major cities today include Rome, Milan, Naples (Napoli), Turin (Torino), Palermo, Genoa (Genova), Bologna, Florence (Firenze) and Venice (Venezia). 3.4 Silvio Berlusconi and the "Second Republic"
Italy, slightly larger than Arizona, is a long peninsula shaped like a boot, surrounded on the west by the Tyrrhenian Sea and on the east by the Adriatic. It is bounded by France, Switzerland, Austria, and Slovenia to the north. The Apennine Mountains form the peninsula's backbone; the Alps form its northern boundary. The largest of its many northern lakes is Garda (143 sq mi; 370 km2); the Po, its principal river, flows from the Alps on Italy's western border and crosses the Lombard plain to the Adriatic Sea. 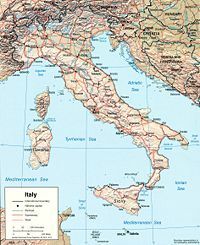 Several islands form part of Italy; the largest are Sicily (9,926 sq mi; 25,708 km2) and Sardinia (9,301 sq mi; 24,090 km2). Area: 301,225 km2. (116,303 sq. mi. ); about the size of Georgia and Florida combined. Cities: Capital—Rome (pop. 2.8 million, 3.7 million metro). Other cities—Milan (1.3 million, 3.9 metro), Naples (975,000, 3 million metro), Turin (900,000, 2.1 million metro). Italy is largely homogeneous linguistically and religiously but is diverse culturally, economically, and politically. Italy has the fifth-highest population density in Europe—about 200 persons per square kilometer (490 per sq. mi.). Minority groups are small, the largest being the German-speaking people of Bolzano Province and the Slovenes around Trieste. There are also small communities of Albanian, Greek, Ladino, and French origin. Immigration has increased in recent years, however, while the Italian population is declining overall due to low birth rates. Although Roman Catholicism is the majority religion—85% of native-born citizens are nominally Catholic—all religious faiths are provided equal freedom before the law by the constitution. Population (November 2009 est. ): Above 60.3 million. Annual growth rate (2007 est. ): 0.01%. Health: Infant mortality rate—5.72/1,000 live births. Life expectancy—77.01 years for men; 83.07 years for women. About 87% of native-born citizens are nominally Catholic, but only 20% regularly participate in worship services. Other significant Christian communities include Orthodox, Jehovah's Witnesses, Assembly of God, the Confederation of Methodist and Waldensian Churches, the Church of Jesus Christ of Latter-day Saints (Mormons), and other small Protestant groups. Non-Catholic Christian groups, Muslims, Jews, Hindus, Baha'is, and Buddhists constitute less than 5% of the population and, with the exception of Jews, are mainly foreign-born. Europe's Renaissance period began in Italy during the 14th and 15th centuries. Literary achievements, such as the poetry of Dante, Petrarch, Tasso, and Ariosto and the prose of Boccaccio, Machiavelli and Manzoni, exerted a tremendous and lasting influence on the subsequent development of Western civilization, as did the painting, sculpture, and architecture contributed by giants such as Leonardo da Vinci, Raphael, Sandro Botticelli, Caravaggio, and Michelangelo Buonarroti. The musical influence of Italian composers Monteverdi, Palestrina, and Vivaldi proved epochal; in the 19th century, Italian romantic opera flourished under composers Gioacchino Rossini, Giuseppe Verdi, and Giacomo Puccini. Contemporary Italian artists, writers, filmmakers, architects, composers, and designers contribute significantly to Western culture. The migrations of Indo-European peoples into Italy probably began about 2000 B.C. and continued down to 1000 B.C. From about the 9th century B.C. until it was overthrown by the Romans in the 3rd century B.C., the Etruscan civilization dominated the area. By 264 B.C. all Italy south of Cisalpine Gaul was under the leadership of Rome. For the next seven centuries, until the barbarian invasions destroyed the western Roman Empire in the 4th and 5th centuries A.D., the history of Italy is largely the history of Rome. From 800 on, the Holy Roman Emperors, Roman Catholic popes, Normans, and Saracens all vied for control over various segments of the Italian peninsula. Numerous city-states, such as Venice and Genoa, whose political and commercial rivalries were intense, and many small principalities flourished in the late Middle Ages. Although Italy remained politically fragmented for centuries, it became the cultural center of the Western world from the 13th to the 16th century. In 1713, after the War of the Spanish Succession, Milan, Naples, and Sardinia were handed over to the Hapsburgs of Austria, which lost some of its Italian territories in 1735. After 1800, Italy was unified by Napoléon, who crowned himself king of Italy in 1805; but with the Congress of Vienna in 1815, Austria once again became the dominant power in a disunited Italy. Austrian armies crushed Italian uprisings in 1820–1821 and 1831. Proclamazione della Repubblica Sassarese - Giuseppe Sciuti, 1880. In the 1830s, Giuseppe Mazzini, a brilliant liberal nationalist, organized the Risorgimento (Resurrection), which laid the foundation for Italian unity. Disappointed Italian patriots looked to the House of Savoy for leadership. Count Camille di Cavour (1810–1861), prime minister of Sardinia in 1852 and the architect of a united Italy, joined England and France in the Crimean War (1853–1856), and in 1859 helped France in a war against Austria, thereby obtaining Lombardy. By plebiscite in 1860, Modena, Parma, Tuscany, and the Romagna voted to join Sardinia. In 1860, Giuseppe Garibaldi conquered Sicily and Naples and turned them over to Sardinia. Victor Emmanuel II, king of Sardinia, was proclaimed king of Italy in 1861. The annexation of Venetia in 1866 and of papal Rome in 1870 marked the complete unification of peninsular Italy into one nation under a constitutional monarchy. Italy declared its neutrality upon the outbreak of World War I on the grounds that Germany had embarked upon an offensive war. In 1915, Italy entered the war on the side of the Allies but obtained less territory than it expected in the postwar settlement. Benito Mussolini, “Il Duce”. a former Socialist, organized discontented Italians in 1919 into the Fascist Party to “rescue Italy from Bolshevism.” He led his Black Shirts in a march on Rome and, on Oct. 28, 1922, became prime minister. He transformed Italy into a dictatorship, embarking on an expansionist foreign policy with the invasion and annexation of Ethiopia in 1935 and allying himself with Adolf Hitler in the Rome-Berlin Axis in 1936. When the Allies invaded Italy in 1943, Mussolini's dictatorship collapsed; he was executed by partisans on April 28, 1945, at Dongo on Lake Como. Following the armistice with the Allies (Sept. 3, 1943), Italy joined the war against Germany as a cobelligerent. A June 1946 plebiscite rejected monarchy and a republic was proclaimed. The peace treaty of Sept. 15, 1947, required Italian renunciation of all claims in Ethiopia and Greece and the cession of the Dodecanese islands to Greece and of five small Alpine areas to France. The Trieste area west of the new Yugoslav territory was made a free territory (until 1954, when the city and a 90-square-mile zone were transferred to Italy and the rest to Yugoslavia). Italy became an integral member of NATO and the European Economic Community (later the EU) as it successfully rebuilt its postwar economy. Until recently, there had been frequent government turnovers since 1945. The dominance of the Christian Democratic (DC) party during much of the postwar period lent continuity and comparative stability to Italy's political situation. A prolonged outbreak of terrorist activities by the left-wing Red Brigades threatened domestic stability in the 1970s, but by the early 1980s the terrorist groups had been suppressed. “Revolving door” governments, political instability, scandal, and corruption characterized Italian politics in the 1980s and 1990s. Silvio Berlusconi and the "Second Republic"
From 1992 to 1997, Italy faced significant challenges as voters—disenchanted with past political paralysis, massive government debt, extensive corruption, and organized crime's considerable influence—demanded political, economic, and ethical reforms. Scandal investigations touched thousands of politicians, administrators, and businessmen. In 1993 referendums, voters approved substantial changes, including moving from a proportional to a largely majoritarian electoral system and the abolishment of some ministries. Major political parties, beset by scandal and loss of voter confidence, underwent far-reaching changes. The end of Soviet Communism caused a crisis on the Left, with a complex reshuffling of voters. Party changes were sweeping. The Christian Democratic Party dissolved; the Italian People's Party and the Christian Democratic Center emerged. Other major parties, such as the Socialists, saw support plummet. For this reason, this period is called the "Second Republic". New political forces and new alignments of power emerged in March 1994 national elections. A new populist and free-market oriented movement, Forza Italia, gained wide support among moderate voters. The National Alliance broke from the neofascist Italian Social Movement. The election saw a major turnover in the new parliament, with 452 out of 630 deputies and 213 out of 315 senators elected for the first time. The 1994 elections also swept media magnate Silvio Berlusconi, and his Freedom Pole coalition, into office as Prime Minister. A trend toward two large coalitions—one on the center-left and the other on the center-right—emerged from the April 1995 regional elections. Berlusconi, however, was forced to step down in January 1995 when one member of his coalition withdrew support. The Berlusconi government was succeeded by a technical government headed by Prime Minister Lamberto Dini, which fell in early 1996. For the 1996 national elections, the center-left parties created the Olive Tree coalition while the center right united again under the Freedom Pole. The new elections in 1996 brought a center-left coalition to government for the first time after World War II. A series of center-left coalitions dominated Italy's political landscape between 1996 and 2001. In April 1996, national elections led to the victory of a center-left coalition (the Olive Tree) under the leadership of Romano Prodi. Prodi's government became the second-longest to stay in power before he narrowly lost a vote of confidence (by three votes) in October 1998. A new government was formed by Democratic Party of the Left leader and former-communist Massimo D'Alema. Italy adopted the euro as its currency in January 1999. Treasury Secretary Carlo Ciampi, who is credited with the economic reforms that permitted Italy to enter the European Monetary Union, was elected president in May 1999. Italy joined its NATO partners in the Kosovo crisis. Aviano Air Base in northern Italy was a crucial base for launching air strikes into Kosovo and Yugoslavia. In April 2000, following a poor showing by his coalition in regional elections, D'Alema resigned. The succeeding center-left government, including most of the same parties, was headed by Giuliano Amato, who previously served as Prime Minister in 1992-93. National elections, held on May 13, 2001, returned Berlusconi to power at the head of the five-party center-right Freedom House coalition, comprising the prime minister's own party, Forza Italia, the National Alliance, the Northern League, the Christian Democratic Center, and the United Christian Democrats. Berlusconi pledged to reduce unemployment, cut taxes, revamp the educational system, and reform the bureaucracy. His critics were alarmed by the apparent conflict of interest of a prime minister who also owned 90% of Italy's media. He was accused of Mafia connections and was under indictment for tax fraud and bribery. Found guilty in three out of four of his trials, he was acquitted in all of them on appeal. Several other cases are pending. In Nov. 2002, Giulio Andreotti, who served as Italy's prime minister numerous times between 1972 and 1992, was sentenced to 24 years for ordering the Mafia to murder a journalist in 1979. At 84, however, he was deemed too old for prison. At the end of 2003, Italian food giant Parmalat was accused of a massive accounting fraud scheme—$5 billion the company claimed was in fact nonexistent. In April 2005, regional elections had disastrous results for Berlusconi's center-right coalition. The dismal state of the economy was blamed for the poor showing. Prime Minister Berlusconi resigned and formed a new government. The 60th government since the liberation of Italy was formed on April 23, 2005, with a new program emphasizing economic concerns. The previous Berlusconi government was the longest serving in Italy’s post-war history. In the same year, parliament passed a new electoral law based on the full proportional assignment of seats. In national elections held April 9–10, 2006, the center-left Union coalition led by Romano Prodi, a successor to the Olive Tree, won 49.8% of the vote and Berlusconi's House of Liberties coalition won 49.7%—a mere 25,000 vote difference. The Union coalition includes the Democratic Party of the Left, the Daisy Party, UDEUR (Union of Democrats for Europe), Rose in the Fist (made up by Italian Social Democrats and Italian Radical Party), Communist Renewal, the Italian Communist Party, and the Greens. Berlusconi refused to concede and called for a recount. He eventually relented, and Prodi was given the go-ahead by the newly installed president Giorgio Napolitano to form a government. Prodi served as prime minister once before (1996–98) and also as president of the European Union. Prodi's government proved fragile almost immediately. Indeed, he submitted his resignation just nine months into his term after a key foreign-policy vote about the deployment of troops to Afghanistan and an expansion of a U. S. military base failed in the Senate. Days later, the Senate, facing the prospect of Silvio Berlusconi returning to power, narrowly passed a vote of confidence in Prodi's government. Prodi remained in office, surely to face similar obstacles in the near future. In April 2006, Italy caught and arrested Bernardo Provenzano, the alleged boss of the Sicilian Mafia, who had eluded authorities for 42 years. In October 2007, the Democrats of the Left and the Daisy parties officially merged to form the Democratic Party. The Prodi government collapsed on January 24, 2008, when it lost a vote of confidence in the Senate and the Prime Minister submitted his resignation to the President. The Prodi government fell when small coalition partner UDEUR withdrew support. In February, the President dissolved parliament and Silvio Berlusconi returned to power after defeating former Rome Mayor Walter Veltroni by a comfortable margin in elections on April 13–14, 2008. Berlusconi's winning coalition was composed of the People of Liberty (a union of Forza Italia and Gianfranco Fini's National Alliance), the Northern League, and the Movement for Autonomy. The election greatly simplified parliament, dramatically reducing the numbers of parties, and for the first time since World War II, leaving communist parties out of parliament. People of Liberty (37.4%) won the largest share of the vote and took power in coalition with a strengthened Northern League (8.3%) and the tiny Movement for Autonomy (1.1%). The Democratic Party scored 33.2% and ran in alliance with Italy of Values (4.4%), while the Union of the Center (5.6%) ran alone. Berlusconi was sworn in as Prime Minister on May 8. Veltroni resigned as leader of the opposition in February 2009, and his deputy, Dario Franceschini, was elected new Democratic Party leader. In March 2009, Forza Italia and National Alliance changed the People of Liberty identification from an alliance to a party. The new mass center-right party is Italy's largest party and one of the largest in Europe. Party leaders define the party as post-ideological, charismatic, and pragmatic. It is led by Berlusconi. In 2010, Gianfranco Fini's conservative party Future and Freedom emerged from a split from Berlusconi's People of Liberty party. After the 2018 Italian elections, which saw populist and anti-establishment parties receive over 50% of the vote, the Five Star Movement and Lega Nord, the latter led by Matteo Salvini, formed a governing coalition. The Italian state is centralized. The prefect of each of the provinces is appointed by and answerable to the central government. In addition to the provinces, the constitution provides for 20 regions with limited governing powers. Five regions—Sardinia, Sicily, Trentino-Alto Adige, Valle d'Aosta, and Friuli-Venezia Giulia—function with special autonomy statutes. The other 15 regions were established in 1970 and vote for regional "councils." The establishment of regional governments throughout Italy has brought some decentralization to the national governmental machinery, and recent governments have devolved further powers to the regions. Many regional governments, particularly in the north of Italy, are seeking additional powers. The 1948 constitution established a perfectly bicameral parliament (Chamber of Deputies and Senate), a separate judiciary, and an executive branch composed of a Council of Ministers (cabinet), headed by the president of the council (prime minister). The president of the republic is elected for seven years by the parliament sitting jointly with a small number of regional delegates. The president nominates the prime minister, who chooses the other ministers. The Council of Ministers—in practice composed mostly of members of parliament—must retain the confidence of both houses. The houses of parliament are popularly and directly elected by a proportional representation system. Under 2005 legislation, the Chamber of Deputies has 630 members (12 of which are elected by Italians abroad). In addition to 315 elected members (six of which are elected by Italians abroad), the Senate includes former presidents and several other persons appointed for life according to special constitutional provisions. Both houses are elected for a maximum of five years, but either may be dissolved before the expiration of its normal term. Legislative bills may originate in either house and must be passed by a majority in both. The Italian judicial system is based on Roman law modified by the Napoleonic code and subsequent statutes. There is only partial judicial review of legislation in the American sense. A constitutional court, which passes on the constitutionality of laws, is a post-World War II innovation. Its powers, volume, and frequency of decisions are not as extensive as those of the U.S. Supreme Court. Italy was a founding member of the European Community—now the European Union (EU). Italy was admitted to the United Nations in 1955 and is a member and strong supporter of the North Atlantic Treaty Organization (NATO), the Organization for Economic Cooperation and Development (OECD), the General Agreement on Tariffs and Trade/World Trade Organization (GATT/WTO), the Organization for Security and Cooperation in Europe (OSCE), and the Council of Europe. It chaired the CSCE (the forerunner of the OSCE) in 1994, the EU from July to December 1990, January to June 1996, and July to December 2003, and the G-8 in 2001 and in 2009. Italy served a two-year term on the UN Security Council in 2007-2008. Italy firmly supports the United Nations and its international security activities. Italy leads the UN mission in Lebanon (UNIFIL) and has actively participated in and deployed troops in support of UN peacekeeping missions in Somalia, Mozambique, and Timor-Leste. It provides critical support for NATO and EU operations in Afghanistan, Bosnia, Kosovo, Albania, Georgia, and Chad. Italy, under NATO's ISAF, maintains a Provincial Reconstruction Team in the western Afghanistan province of Herat, commands RC-West, and maintains a Carabinieri police training center. Italy supports reconstruction and development assistance to the Iraqi people through humanitarian workers and other officials, particularly in Dhi Qar Province, and is a leading contributor to the NATO Training Mission-Iraq, with approximately 100 military personnel and Carabinieri police trainers. Currently almost 9,000 Italian troops are deployed, including 2,100 in Kosovo, 2,350 in Lebanon as part of UNIFIL, and over 2,600 in Afghanistan. It will send another 1000 troops for the surge in Afghanistan in 2010. The Italian Army, Esercito Italiano, is the ground branch and numbers above 108,000 troops. Its most famous equipment include the C-1 Ariete main battle tank, the Centauro wheeled armored car, the AR-70/90 assault rifle and the Beretta M9 pistol, which is also used by the United States armed forces. Among the corps which make up the Army, it's worthy to remember: the Alpini (mountain troops), the Bersaglieri (light infantry) and the Lagunari (marines). The Italian Navy, Marina Militare, is the sea branch and counts 31,000 sailors and 70 warships, among them: the Cavour and Garibaldi aircraft carriers, the Horizon destroyers and the Amerigo Vespucci school sailship for naval cadets. The Com.Sub.In. (Underwater Incursion Command) are the Italian Navy SEALs, extremely well trained and with a long history of daring victories. The Italian Air Force, Aeronautica Militare, is the air branch and musters 42,960 airmen and officers and 665 planes and helicopters. Its acrobatic patrol is highly famed and is known as the Tricolor Arrows'. The Carabinieri Corps, Arma dei Carabinieri is the national gendarmery force, 120,000-strong. Formerly part of the Army, the Carabinieri act both as a civilian police force and a military one. They maintain some combat-ready light infantry units, the "Hunters" regiments. The Italian armed forces relied upon conscription for almost a hundred and fifty years, but mandatory service was abolished in 2005, moving them to a professionist, volunteer model. Palace of the "Banca Commerciale Italiana", Milan. The Italian economy has changed dramatically since the end of World War II. From an agricultural-based economy, it has developed into an industrial state ranked as the world's sixth-largest market economy. Italy belongs to the Group of Eight (G-8) industrialized nations; it is a member of the European Union and the Organization for Economic Cooperation and Development (OECD). Italy has few natural resources. With much land unsuited for farming, Italy is a net food importer. There are no substantial deposits of iron, coal, or oil. Proven natural gas reserves, mainly in the Po Valley and offshore Adriatic, constitute the country's most important mineral resource. Most raw materials needed for manufacturing and more than 80% of the country's energy sources are imported. Italy's economic strength is in the processing and the manufacturing of goods, primarily in small and medium-sized family-owned firms. Its major industries are precision machinery, motor vehicles, chemicals, pharmaceuticals, electric goods, and fashion and clothing. Italy's economic growth averaged only 0.66% for the five years ending in 2005; 2006 GDP growth reached 1.9%, largely due to export growth to the Euro zone area. Italy continues to grapple with budget deficits and high public debt—2.6% and 105.9% of GDP for 2008, respectively. Italy joined the European Monetary Union in 1998 by signing the Stability and Growth Pact, and as a condition of this Euro zone membership, Italy must keep its budget deficit beneath a 3% ceiling. The Italian Government has found it difficult to bring the budget deficit down to a level that would allow a rapid decrease of that debt. The worsening of the economic situation is expected to jeopardize this effort. The deficit is expected to grow well above the 3% ceiling in 2009 and 2010. Italy's economic growth averaged only 0.8% in the period 2001-2008; 2008 GDP decreased 1.0%, largely due to the global economic crisis and its impact on exports and domestic demand. GDP is expected to contract further, with a huge decrease in 2009 (ranging from 2% to 3%) as the Euro zone and world economies slow. Italy's closest trade ties are with the other countries of the European Union, with whom it conducts about 60.1% of its total trade (2007 data). Its largest EU trade partners are Germany (12.9%), France (11.4%), and the United Kingdom (5.8%). Italy continues to grapple with the effects of globalization, where China has undersold the Italian lower-end industrial product sector. The Italian economy is also affected by a large underground economy—worth some 27% of its GDP. This production is not subject, of course, to taxation and thus remains a source of lost revenue to the local and central government. GDP (purchasing power parity, 2007 est. ): $1.8 trillion. GDP per capita (purchasing power parity, 2007 est. ): $31,000. GDP growth: 1.7% (2007); 1.9% (2006); 0.1% (2005); 0.9% (2003 est. ); 0.4% (2002); 1.8% (2001). Natural resources: Fish and natural gas. Agriculture: Products—wheat, rice, grapes, olives, citrus fruits, potatoes, sugar beets, soybeans beef, dairy products. Industry: Types—tourism, machinery, iron and steel, chemicals, food processing, textiles, motor vehicles, clothing, footwear, ceramics. Trade: Exports (2007 est.) --$474.8 billion f.o.b. : mechanical products, textiles and apparel, transportation equipment, metal products, chemical products, food and agricultural products. Partners (2006)--Germany 13.2%, France 12.3%, U.S. 7.5%, Spain 7.5%, U.K. 6.6%. Imports (2007 est.) --$483.6 billion f.o.b. : machinery and transport equipment, foodstuffs, ferrous and nonferrous metals, wool, cotton, energy products. Partners (2006)--Germany 17.3%, France 10.0%, Netherlands 5.7%, China 5.2%, Belgium 4.5%, Spain 4.3%. Thomas Moran, Amalfi Coast, ca. 1867 - 68. The United States and Italy cooperate closely on major economic issues, including within the G-8. With a large population and a high per capita income, Italy was the United States' twelfth-largest trading partner in 2008, with total bilateral trade of $51.6 billion comprised of exports to Italy totaling $15.5 billion and imports worth $36.1 billion. The U.S.'s $20.7 billion deficit with Italy in 2008 was slightly below the $20.9 billion deficit registered in 2007. Machinery and aircraft are becoming important U.S. exports. U.S. foreign direct investment in Italy at the end of 2007 exceeded $28.4 billion. Unemployment is a regional issue in Italy—low in the north, high in the south. The overall national rate is at its lowest level since 1992. Chronic problems of inadequate infrastructure, corruption, and organized crime act as disincentives to investment and job creation in the south. A significant underground economy absorbs substantial numbers of people, but they work for low wages and without standard social benefits and protections. Women and youth have significantly higher rates of unemployment than do men. Unions claim to represent 40% of the work force. Most Italian unions are grouped in four major confederations: the General Italian Confederation of Labor (CGIL), the Italian Confederation of Workers' Unions (CISL), the Italian Union of Labor (UIL), and the General Union of Labor (UGL), which together claim 35% of the work force. These confederations formerly were associated with important political parties or currents, but they have evolved into fully autonomous, professional bodies. The CGIL, CISL, and UIL are affiliated with the International Confederation of Free Trade Unions (ICFTU) and customarily coordinate their positions before confronting management or lobbying the government. The confederations have had an important consultative role on national social and economic issues. Italy's agriculture is typical of the division between the agricultures of the northern and southern countries of the European Union. The northern part of Italy produces primarily grains, sugarbeets, soybeans, meat, and dairy products, while the south specializes in fruits, vegetables, olive oil, wine, and durum wheat. Even though much of its mountainous terrain is unsuitable for farming, Italy has a large work force (1.4 million) employed in farming. Most farms are small, with the average size being only seven hectares. ↑ The Vatican City, the governmental center of the Roman Catholic Church, lies entirely within the boundaries of the capital city, Rome. The equally tiny sovereign state of San Marino is also entirely within Italy. This page was last modified on 2 June 2018, at 16:17. This page has been accessed 40,819 times.